You are Phyllis Oakley, a dealer in rare books. You know all the tricks of the trade. You scour second-hand stalls, private auctions, secret bibliophile clubs, looking for what your clients seek. You have contacts all over London, lesser book-hunters and traders and barrow-rummagers who sometimes turn up something valuable. One of your most valuable contacts was Alf Fulbrow. Six months ago, you attended his funeral. Drowned, his daughter said. So who left that rare occult book on your doorstep last night? What ancient force, awoken from the slumber of three thousand years, stalks the streets of London? 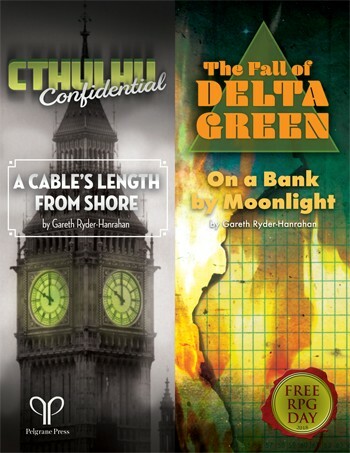 Cthulhu Confidential is a game for two – one player, and one Game Moderator. All alone against the darkness, can you navigate the mystery and survive the horrors of the Cthulhu Mythos? 1968. Two people in the small town of Milltown, NY die on the same night. One was a tragic car accident; the other, shot in self-defence by the police. Both were members of the same commune of hippies and drop-outs that’s taken over a farm just outside town. Police reports contain references to chanting. To carven idols. To strange ceremonies by moonlight. As Agents of DELTA GREEN, a top-secret branch of the US Government, your mission is to investigate those deaths, find out the truth – and take whatever action is necessary to eradicate any unnatural influence. When your predecessors raided Innsmouth in 1928, DELTA GREEN saw what the unnatural can do if it takes root in America. It cannot be allowed to happen again.